The spring semester is over and summer school doesn’t start until next week, so in spite of the grading and class prep that lingers, I’m treating this week like my vacation. I kicked it off with a a whole bunch of reading in bed interspersed with grading and rec letter writing–there’s always some work to do–before checking the weather report with my lunch to see if it was going to rain. As I clicked through to Baltimore at the internet weather site the skies opened up and it was pouring. Huh. Maybe not the very best day to ride a bike around. I waited for the rain to slow down, and then hopped on the bike to head down to the movie theater for that most luxurious of all luxuries–the afternoon movie. I went with a period British romance, the part where they usually leave out a critical interrogation of colonialism and slavery be damned–I’m on vacation–and zoned out with a popcorn all by myself. The best. When I left the movie it was all blue skies and humid sunshine, so I got back on the bike and headed generally south and east. I followed the Fallsway bike path until a left on Eager. Past the jail, blocks of vacants, two parks, Latrobe Homes, a right at EBDI and another left and a right, and then I was at Madison Street to meet the ladyfriend for a ride home up the hill, because I’m on vacation–all downhill from here. I snapped this picture of the busy-on-the-weekends Frank C. Bocek Park. It’s just downwind from a city recycling facility, and it’s often strewn with trash. Today it was a perfect patch of green punctuated by tilted uprights because it’s always something in this city, I swear. I couldn’t find any info on Frank Bocek, though–anybody know anything? 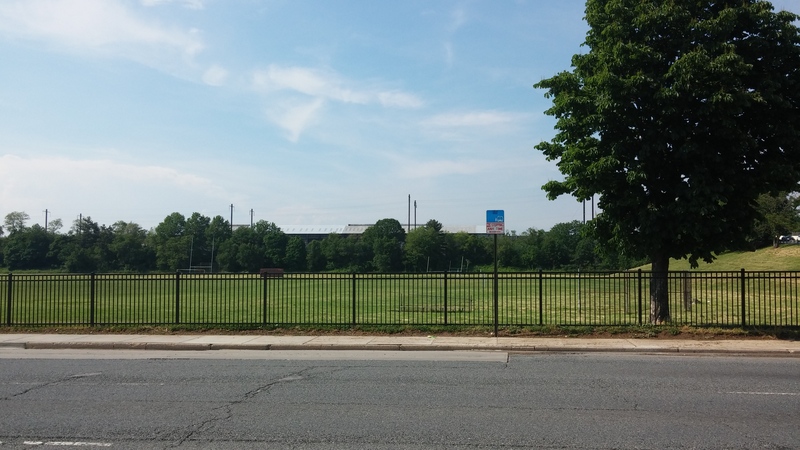 This entry was posted in parks and tagged Baltimore, East Baltimore, Frank C. Bocek Park. Bookmark the permalink.